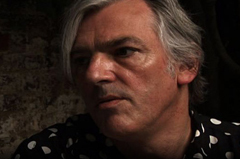 In the summer of 2006, Robyn Hitchcock recorded a group of new songs in his London house , with help from famous musician friends, including REM's lead guitarist Peter Buck, legendary songwriter Nick Lowe and John Paul Jones of Led Zeppelin. This documentary eavesdrops on Hitchcock at work as he adds to his stockpile of dark ,witty and surreal rock songs and explores with contributors including Gillian Welch and David Rawlings what makes Hitchcock's songs so memorable. The film culminates with the band taking the songs on the road in America. Premiered at SXSW festival, Austin Texas, 2007. Shown on the Sundance Channel in the US and BBC4 in the UK. Great documentary following the idiosyncratic singer as he records his latest album at home with a couple of friends. A film that’s confident enough to sit back and let this corner of the rock world unfold at its own pace, much as Hitchcock’s 30-odd year career has done.